The Waurika Eagles won the District Championship tonight at home against the Empire Bulldogs. It was an exciting game. Obviously the complete story will be in this upcoming week’s paper told by Trey Smart, but for now we just wanted to say congratulations to the Waurika Eagles on a perfect season. Waurika opened the 2019 season on the road Tuesday night as the Eagles and Lady Eagles traveled to Geronimo. The Lady Eagles won a thriller, 44-43, while the Waurika boys fell to Geronimo, 45-35. Both teams will be in action tomorrow night when Waurika will play host to Elmore City-Pernell. Tipoff is 6:30 for the girls’ game at the Waurika gym. The Lady Eagles trailed Geronimo much of the first quarter until Madison Roberson completed a traditional three-point play to knot the score at 10 with 2:56 remaining in the initial period. Waurika ended the quarter with five straight points and held a 17-12 lead. The Lady Eagles dominated the second quarter. Waurika outscored Geronimo 8-1 in the first six minutes of the second quarter and went to the locker room with a commanding 28-16 lead after Asia Smith’s three-pointer with six seconds showing on the clock. 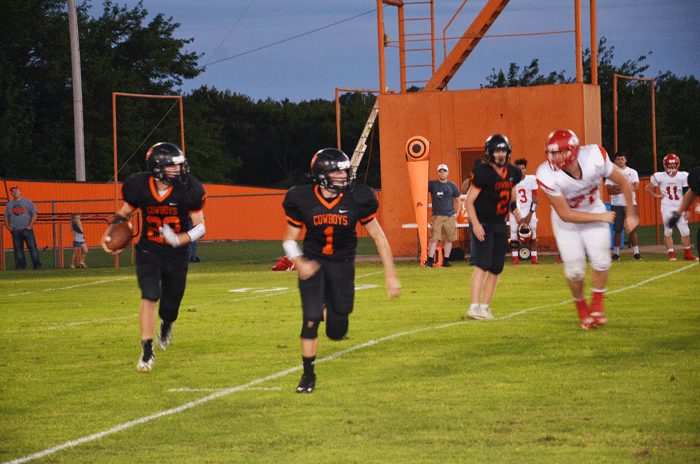 Geronimo rallied in the third quarter and a 6-0 spurt to end the period cut Waurika’s lead to 35-33. Waurika extended the lead to 38-33 on Gracie Walling’s layup with 6:46 left in the game, but Geronimo scored the next six points to grab the lead at 39-38 with 2:47 left in the contest. A free throw by Geronimo’s Lottie Deere gave Geronimo a 40-38 advantage with 2:24 left and Smith tied the game with a short jumper with just over two minutes left. The teams traded turnovers and with 58 seconds to play Jade Bessemer nailed a three-pointer to put Geronimo back in front, 43-40. The Lady Eagles got within one when Roberson got an offensive rebound and put the ball in the basket leaving Waurika trailing, 43-42, with 33.5 seconds left. The final 30 seconds had both teams scurrying. Waurika had not committed enough fouls to send Geronimo to the free throw line. Madison Dees made two big plays to end the game. Dees got a steal with 15 seconds left and was fouled with 11.3 showing on the clock. She missed both free throws, but Roberson grabbed the rebound and missed. Dees was right there to get the miss and put the ball in the basket with 5.3 seconds showing. The Lady Blue Jays turned the ball over to help preserve the Waurika win. Roberson was outstanding for the Lady Eagles and dominated the inside. She finished with 22 points and Gracie Walling chipped in 11 points. 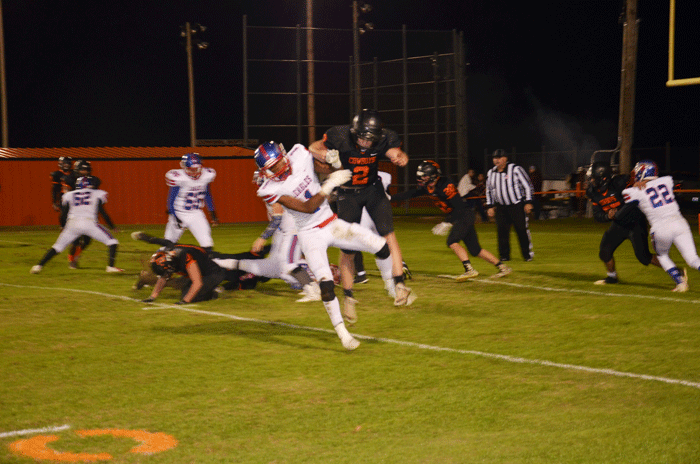 Geronimo stayed in the game by taking advantage of 23 Waurika turnovers. The Lady Eagles held the edge in rebounds, 34-23. In the boys’ contest, it appeared Waurika would record a sweep as the Eagles led after one, 13-10 and held onto the lead at halftime, 20-17. Geronimo got two free throws to open the third quarter, but Waurika reeled off six straight points for a 26-19 advantage with 5:13 left in the quarter when Turner Mora put back a missed shot. That would be the largest lead of the game for Waurika. Kevin Garcia got a layup off an inbounds play with 1:46 left to give Waurika a 31-25 lead, but Geronimo closed the third quarter on a 7-0 run and took a 32-31 lead when Jadyn Taylor hit a 14-footer at the buzzer. The Eagles never recovered. Taylor opened the fourth quarter with a bucket before Cache Arellano tied the game at 34-34 with a trey at the 6:09 mark. Arellano moved the Eagles in front for the final time by converting one of two free throws putting Waurika on top, 35-34, with 5:50 left. That would be the final point scored by the Eagles. Geronimo finished the game on an 11-0 run which was fueled by excellent free throw shooting by the Blue Jays. Geronimo hit seven of nine free throws to seal the victory. The game was somewhat sloppy with Waurika committing 25 turnovers and Geronimo recording 23 turnovers. Waurika dominated the boards with a 42-28 advantage. The Eagles showed the effects of just a couple of practices after having ended the football season last Friday. 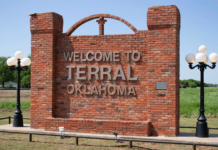 Waurika will hit the road again Tuesday when they travel to Temple and then one week from today the basketball squads will begin play in the Comet Classic at Velma-Alma. WAURIKA – Asia Smith 3-0-7, Faith Roberson 0-1-1, Tallin Mora 1-0-2, Hope Cummings 1-0-2, Madison Dees 1-0-2, Gracie Walling 4-3-11, Madison Roberson 8-5-22. TOTALS: 18-9-45. 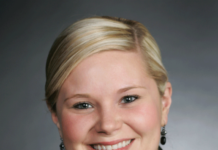 Three-pointers: Smith. GERONIMO – Elizabeth McCarthy 6-1-15, Hailey Werger 1-0-2, Jade Bessemer 2-1-7, Precious Reeder 3-6-12, Lottie Deere 3-1-7. TOTALS: 15-9-43. Three-pointers: McCarthy 2, Bessemer 2. WAURIKA – Turner Mora 1-0-2, Aaron Nitka 3-4-10, Payton Fletcher 1-0-2, Kevin Garcia 2-0-4, Cache Arellano 6-2-17. TOTALS: 13-6-35. Three-pointers: Arellano 3. GERONIMO – Jadyn Taylor 3-1-7, Collin Barvientos 1-0-2, Wyatt Johnson 1-2-4, Christian Ussery 7-5-22, Billy Allen 1-0-3, Spencer Jones 1-3-5, David Leveille 1-0-2. TOTALS: 15-11-45. Three-pointers: Ussery 4, Allen. 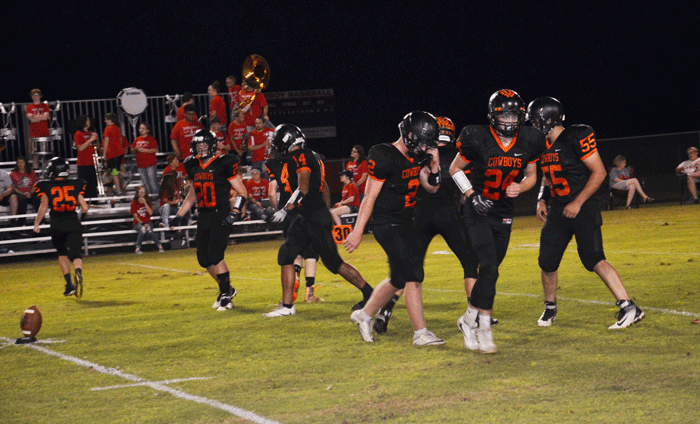 The Waurika Eagles overcame a somewhat sluggish start to the first and second half of last Friday’s contest with Empire to claim a 68-22 victory over the Bulldogs. The win earned the Eagles their first district title since 2016 and will ensure the squad of two home playoff games. 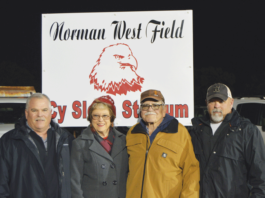 The first game will be tomorrow night at Cy Sloan Stadium when Waurika will play host to Cyril in a rematch of last year’s first-round contest. Kickoff is set for 7:30 p.m. Empire took the opening kickoff and moved 66 yards in 11 plays to get the first score of the game. Rodolfo Martinez found a wide-open Lucas Contreras on a 23-yard touchdown pass and Martinez ran for the two points to put Empire in front, 8-0, with 7:58 to play in the first quarter. 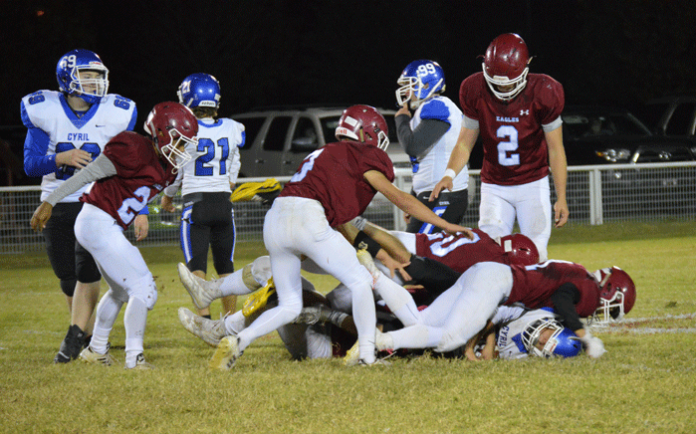 The score by the Bulldogs apparently ignited the Eagles as they took the ensuing kickoff and in just two plays traveled 56 yards for the game-tying score. 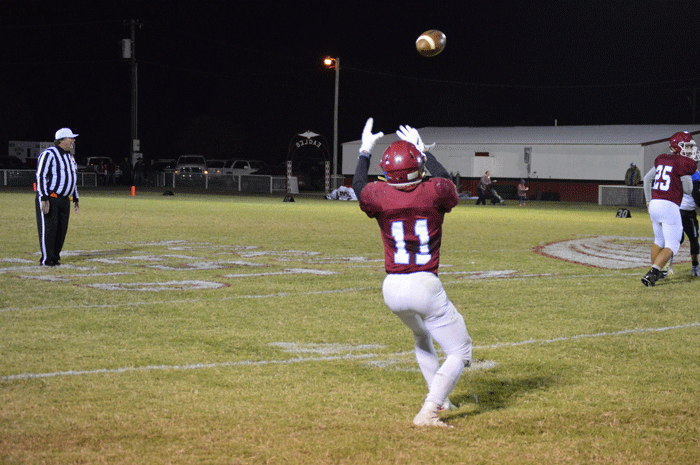 Turner Mora connected with Colton Bryant on a 43-yard pass play for the touchdown. Zac Brown added the two-point conversion to tie the game at 8-8. 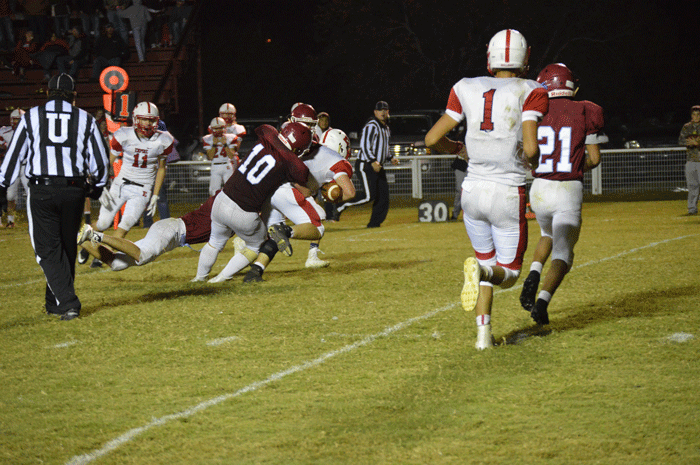 Empire looked like it would answer the Eagle challenge as they drove the ball deep inside Waurika territory before a fourth down stop ended the threat at the Eagle 16. 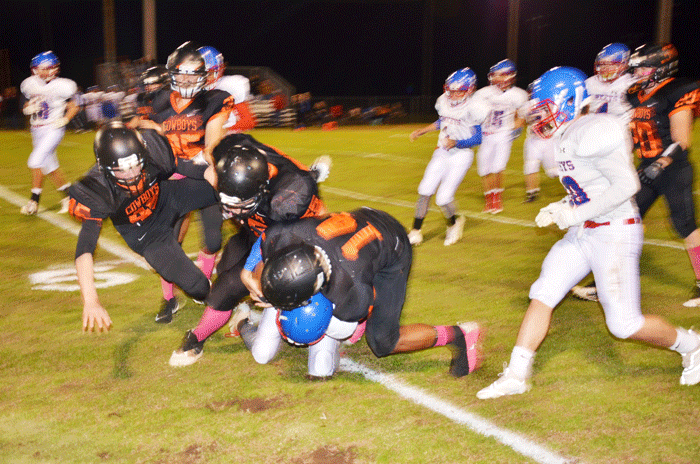 Gatlin Black shutting down an Empire ball carrier. 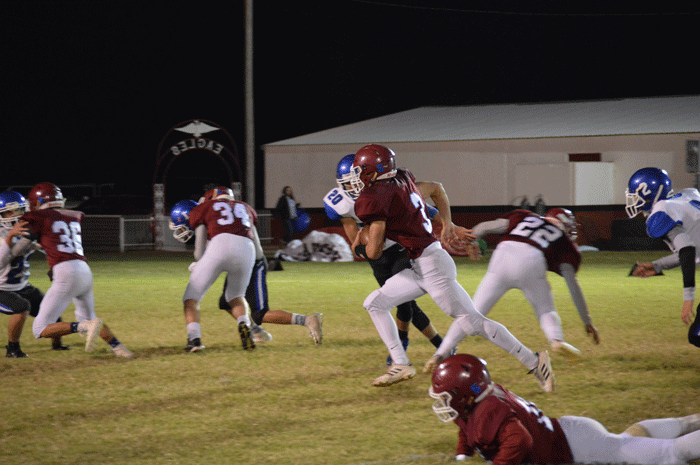 On Waurika’s next possession the Eagles could not pick up a first down and on fourth down Empire blocked the Waurika punt and took possession at the Eagle 12. 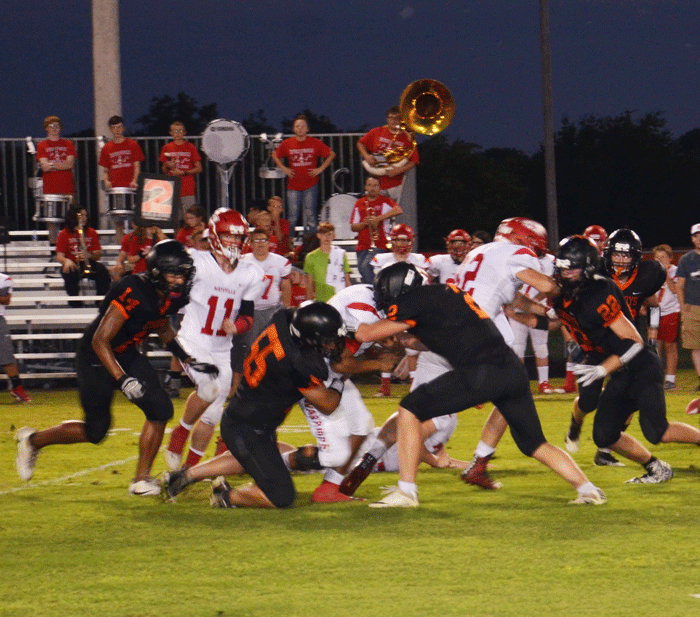 The Bulldogs, however, handed the ball right back to Waurika as they fumbled at the Eagle 10 and the Waurika offense was back on the field. The Eagles looked poised for the go-ahead score as a long drive ended the first quarter, but early in the second quarter the drive ended on a failed fourth down play just inside Empire’s 20-yard line. Empire gambled on its next drive and it proved to be a costly one. On a fourth and short the Bulldogs elected to go for it but were stopped giving the Eagles excellent field position at the Bulldog 32-yard line. Zac Brown looking for an opening in the Empire defensive life. In just three plays the Eagles got the go-ahead score as Mora found Kevin Garcia for a 33-yard touchdown pass. Mora ran for the two points and Waurika’s lead expanded to 16-8 with 5:47 to play in the half. Another failed fourth down attempt on Empire’s next drive set Waurika up inside Bulldog territory at the 41-yard line. On the first play, Mora swept to the left side and scooted down the sideline 41 yards for the score. The try for two failed, but Waurika held a 22-8 lead with 4:11 left before intermission. 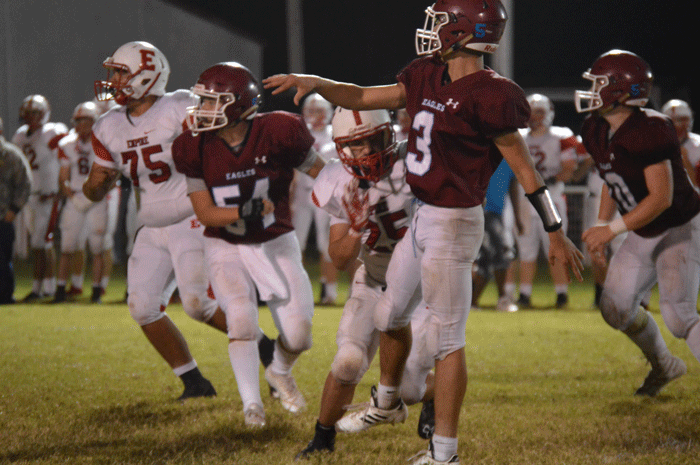 The Eagles were not through lighting up the scoreboard in the quarter as Empire failed on yet another fourth down attempt and gave Waurika the ball at the Empire 37. Waurika could not move and was in punt formation on fourth down when Mora from punt formation took the ball and after being forced to reverse his direction, picked up 12 yards to keep the drive alive. Edwin Garcia scoring a touchdown in Waurika’s game against Empire. After an incomplete pass, Mora spotted a wide open Garcia for a 25-yard touchdown pass. Bryant added the two points and Waurika held a commanding 30-8 advantage heading to the locker room. Empire threatened to tighten the game early in the second half. After stopping Waurika’s opening drive, the Bulldogs went 59 yards on three plays for a touchdown. The big play was a 38-yard scoring run by Peyton Booth and Brandon Mendenall caught the two-point conversion pass from Martinez to make it a 30-16 game with 8:52 left in the third quarter. Again the Eagles shook off the uninspired effort and after a failed onside kick by Empire Waurika took the pigskin and traveled 49 yards on four plays. Mora found a wide open Edwin Garcia for a 35-yard scoring pass. After Bryant ran for the two-point conversion, the Eagles held a 38-16 advantage with 7:46 left in the third quarter. Empire did not fold, however, and drove all the way to the Waurika 11-yard line before a fourth down effort resulted in a four-yard loss. The Eagles took the ball and marched the length of the field helped a pass interference penalty and two unsportsmanlike conduct fouls on Empire. The score came on a 14-yard pass from Mora to Aaron Nitka to extend the Waurika lead to 44-16 with 11:19 to play in the game. Turner Mora and the Waurika offensive line. 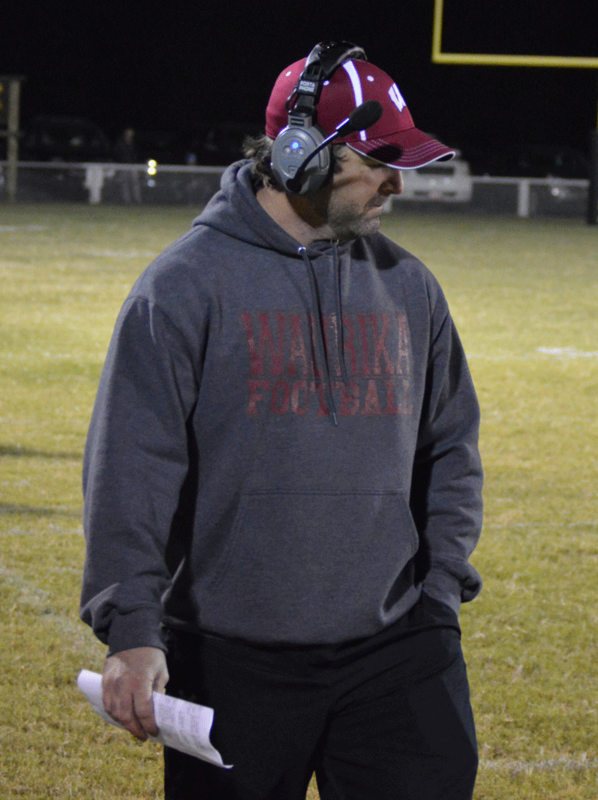 After another failed attempt on fourth down, Waurika took over at the Bulldog 27. On the first play, Brown found paydirt on a 27-yard scamper to the end zone. Bryant ran for the two points and the Eagles were firmly in command with a 52-16 lead. The Bulldogs’ final score of the night came on a 30-yard touchdown pass from Martinez to Meray Weber. This put the margin at 52-22 with 5:44 to play in the game. Empire attempted another onside kick, but this time Mora picked up the ball and sprinted 50 yards for a touchdown. Matt Arriolla ran for the two points and Waurika held a 60-22 lead with 5:35 left in the game. The Bulldogs could not move on the next drive and punted to the Eagles. Brown capped the drive with a 29-yard run and after Bryant ran for the two-point conversion the game ended on the mercy rule with 3:14 left in the game. With the Eagles getting a short field most of the night, the top ball carrier for Waurika, Mora, had only 73 yards on the ground, but the talented quarterback threw for 189 yards on the night. Brown added 64 yards and Bryant had 50 to help the Eagle offense. 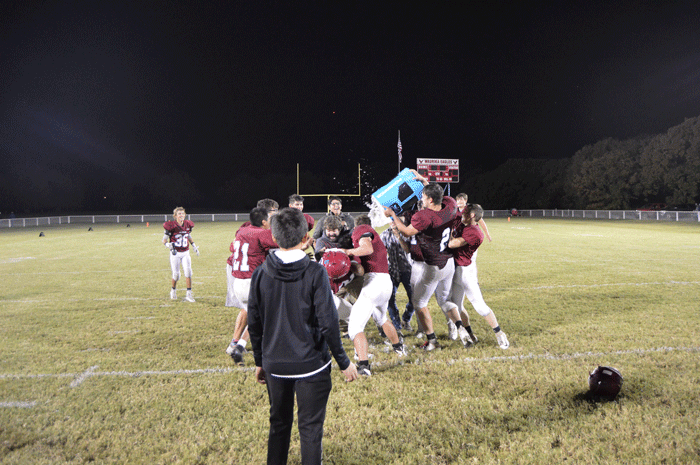 Coach Joe Allen is congratulated with a Gatorade bath following Waurika’s victory over Empire. 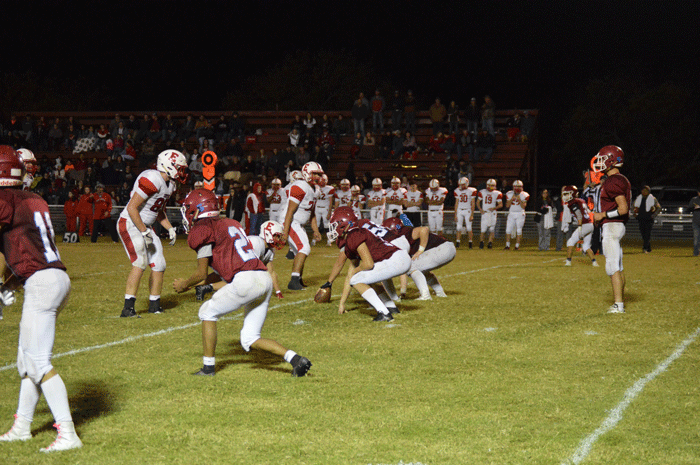 EAGLE FLIGHTS: Waurika now holds a 21-11 advantage in the series with Empire that started in 1974 when Empire began playing football…The two schools have split the two meetings in eight-man competition…The 68 points scored by the Eagles is the most in the history of the series with the Bulldogs….The 22 points scored by the Bulldogs was the most for Empire in a losing cause in games with Waurika….The 46-point margin of victory for Waurika is tied for the third highest margin of victory in the 32 games with Empire…The game turned a bit ugly in the second half as the Empire bench was called for a total of three unsportsmanlike conduct penalties and the head coach for the Bulldogs being ejected last in the game….This will be the fourth straight playoff appearance for Waurika after going 14 years without a playoff appearance….Waurika head coach Joe Allen is the first coach in school history to compile an undefeated regular season in the first year as a head coach. 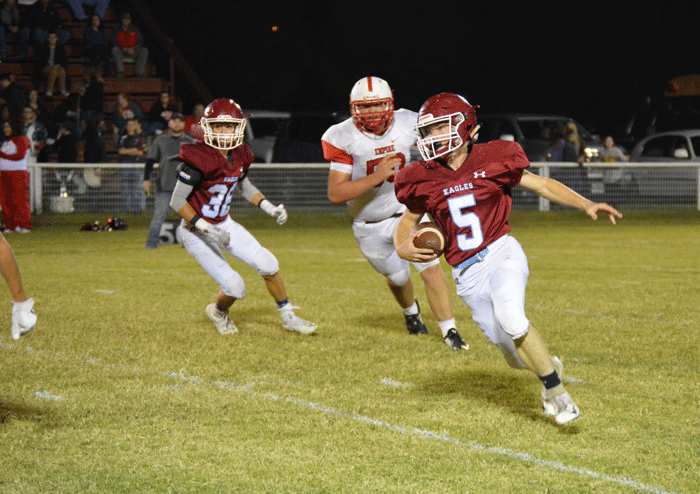 It took a little longer than most of Waurika’s victories in the 2018 season, but the Eagles eventually came away with another 48-0 mercy-rule victory over Cyril last Friday night in the first round of the Class B playoffs. The Eagles will host a second-round playoff game and will face Cherokee tomorrow night (Friday). Kickoff is slated for 7:30 p.m. at the newly-named Norman West Field at Cy Sloan Stadium. He has said in an interview that he is proud of the staff and how well they have worked together as well as the team. 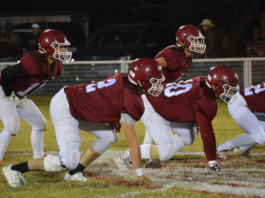 The Eagles totally dominated the game especially on defense giving up only 40 total yards through just over three and half quarters of play before Waurika ended the game by the 45-point rule. Waurika got the first break of the game when a fourth-down punt attempt went awry when the ball was snapped over the punter’s head. The Eagles took possession at the Cyril 23 and in just two plays scored the first touchdown. Turner Mora covered the final 21 yards. Zac Brown ran for the two points give Waurika an 8-0 advantage with 9:51 left in the first quarter. The Pirates had snap issues on the next possession and Cyril was forced to punt after two bad snaps and a quarterback sack by Aaron Nitka. The Eagles set up at their own 42 and marched the 58 yards in just three plays Waurika had its second score of the night. Mora scooted down the left sideline and was tackled just inside the Cyril one for a 41-yard gain. Colton Bryant took the ball over the goal line on the next play to give Waurika a 14-0 lead with 7:17 showing on the first quarter clock. 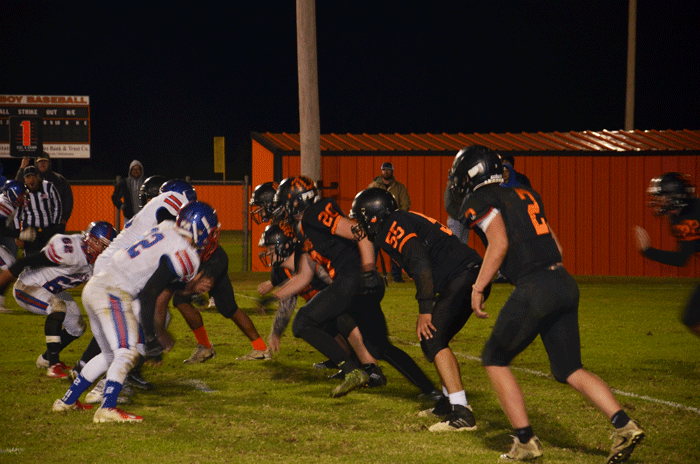 After holding Cyril to another three-and-out, the Eagles started another drive at the Waurika 26. In just three plays the Eagles covered the 74 yards for another score. The big play of the drive was a 54-yard pass to Edwin Garcia that put the Eagles deep in Pirate territory. Two plays later, Mora picked up a bad snap and walked into the end zone from seven yards out. The two-point conversion failed, but Waurika held a 20-0 lead with 4:09 still to play in the first quarter. Aaron Nitka tackling a Cyril player. 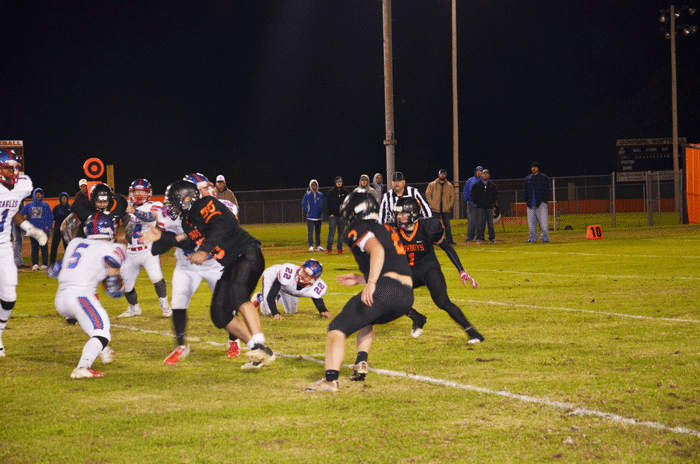 After a series of exchanges in possessions, Cyril finally got something going as the Pirates moved from their own 48 to the Waurika one, but on a fourth down play, Gatlin Black crashed through to drop the Cyril quarterback for a five-yard loss. On Cyril’s next possession, Hunter Wesberry picked off a Pirate pass, but the Eagles were stymied after being stopped short on a fourth down play. The Pirates took over on downs but on first down, Black pounced on a Cyril fumble giving the ball back to the Eagles. This time the Eagles took advantage of the turnover and in just two plays moved the 33 yards for the score. Kevin Garcia scored from 17 yards out and after the two-point conversion failed, the Eagles held a 26-0 lead with just 11 seconds left in the half. The second half opened with a failed Cyril onside kick that Austin Dyer recovered at midfield. On first down, K. Garcia went the distance for the score. The two-point conversion failed, but Waurika was in front, 32-0, with 11:48 left in the third quarter. 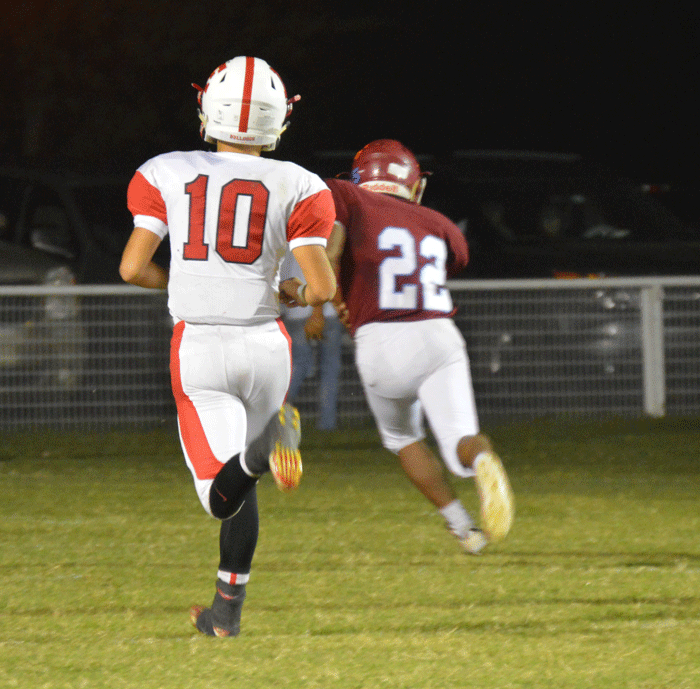 Cyril could not move on its next drive and after Waurika took possession, Cyril’s Jose Rivera intercepted a Mora pass giving the Pirates possession at Cyril seven-yard line. On first down, the Cyril quarterback scrambled back into the end zone and was met by Mora and Jordan Watkins for a safety that increased the Waurika lead to 34-0 with 7:50 left in the third quarter. The free kick was returned to the Cyril four and Bryant scored on a four-yard run on first down. 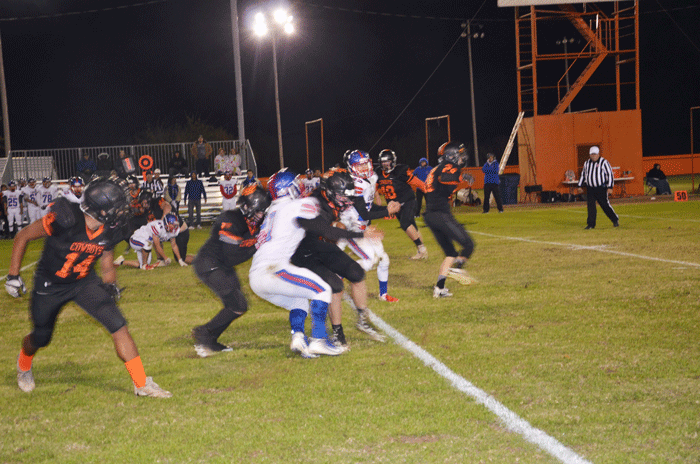 Brown got the two-point conversion and Waurika held a commanding 42-0 advantage with 7:40 left in the third quarter. 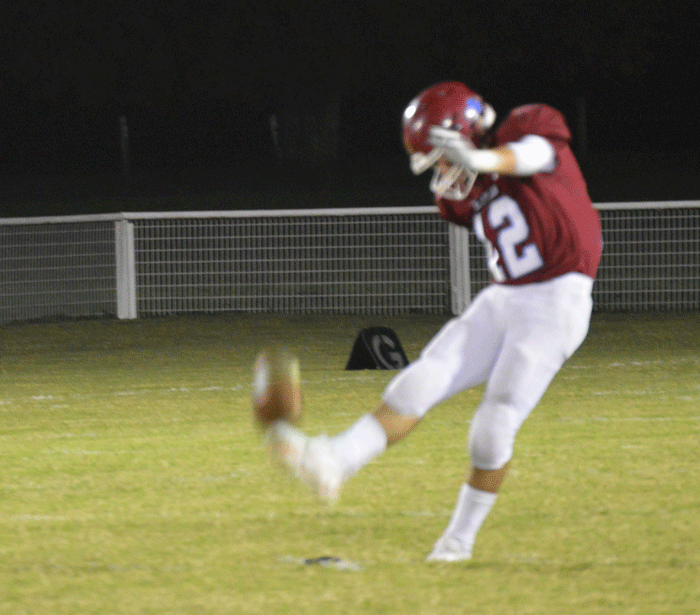 With the mercy-rule victory now in sight, the Eagles attempted an onside kick which Waurika’s Dyer was able to retrieve giving the Eagles the ball. In six plays the Eagles were able to get the game-ending score as Mora scored from one yard away with 5:45 left in the third quarter. 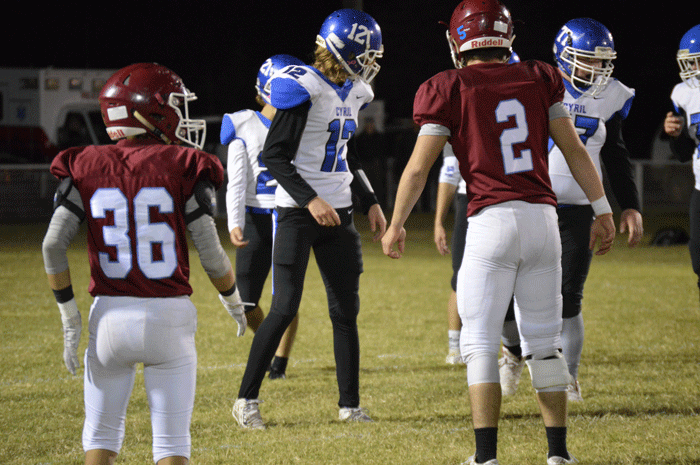 EAGLE FLIGHTS: The 48-point margin of victory is the third best in school history behind the 55-point margin against Haileyville in 1988 and the 51-point win over Okemah in the 1951 state finals….The 48 points scored by the Eagles is the sixth most in school history during post-season play…The Eagles are 2-3 in the playoffs since moving to eight-man play and both wins have come over Cyril….This was the third time the Eagles have held an opponent to less than 40 yards of total offense during the 2018 season….Cyril still leads the series with the Eagles with four wins in the seven meetings….Waurika is 10-0 for only the second time in school history….This is the second time since beginning eight-man play the Eagles have advanced to the second round and only the third time since the 1996 season. It was the season opener for the Ryan Cowboys and Cowgirls Tuesday night and both games came down to the wire. The Cowgirls fell to Grandfield, 34-32, while the boys picked up a 37-31 victory over the Bearcats. Ryan begins play today in the St. Jo, Texas Tournament. The Cowgirls will play Alvord, Texas in the first round, while the Cowboys are set to play Paradise, Texas junior varsity. Both teams will return to action on Friday. The Cowgirls trailed 11-10 after the first quarter, but managed to tie the game at the half, 17-17, despite hitting only three of 11 from the free throw line. The Lady Bearcats managed to outscore the Cowgirls, 8-6, in the third quarter setting up a dramatic ending to the contest. That two-point edge ended up being the difference in the game as the two teams battled on even terms in the fourth quarter. The Cowgirls had a game-winning three-pointer rim out at the buzzer. Samantha Good led the Cowgirls in scoring with 14 points. Lily York was the only other Cowgirl in double figures as she finished with 10 points. Free throw shooting, which hampered the Cowgirls most of the 2018 season, was the Achilles heel for Coach Steve Spangler’s squad in the season opener. Ryan connected on only seven of 17 from the charity stripe in the game. In the boys’ contest, the Bearcats looked like they would run the Cowboys out of the gym. The Bearcats took a 7-2 lead after the first quarter and increased the lead to 20-11 at intermission. The two teams played on even terms in the third quarter and the Cowboys entered the fourth quarter trailing, 29-19. However, in the final frame, the Cowboys caught fire and outscored the Bearcats, 18-2, to capture the victory. The game did not exactly feature great shooting. The Cowboys managed to shoot 36% from the field but were only one of nine from the three-point line. The Bearcats were much worse. Grandfield connected on only nine of 35 two-point field goal attempts and only connected on two of 25 three-pointers for a dismal 18% from the field. The Cowboys might have stayed closer in the first half, but they made only three of 11 free throws and finished the game hitting only 25% from the line. Defensively, the Cowboys had 10 steals and out-rebounded the Bearcats, 42-34. Grayson Tomberlin led the Cowboys in scoring with 15 points and was the only Cowboy in double figures. Cowboy coach Austin Masoner garnered his first coaching win with the victory over Grandfield. After competing in the tournament at St. Jo, the Cowboys and Cowgirls will be off until one week from today when they begin play in the Black and Gold Classic at Wilson. RYAN – Samantha Good 6-2-14, Lily York 4-1-10, Alicen Williams 1-4-6, Lilybet Harmon 1-0-2. TOTALS: 12-7-32. Three-pointers: York. RYAN – Grayson Tomberlin 6-2-15, Skyler Parkhill 3-1-7, Andrew Villerreal 2-1-5, Brock Smith 2-0-4, Travis Fristoe 2-0-4, Landon Alexander 1-0-2. TOTALS: 16-4-37. Three-pointers: Tomberlin. It will likely be a trying season for the Ryan Cowboy and Cowgirl basketball squads. The most trying aspect of the upcoming 2018-19 season will be having a place to play and practice as the Ryan gym undergoes a significant makeover. It is hoped that a limited number of games can be played at home, but otherwise the Cowboys and Cowgirls will be on the road most of the season. The Cowgirls and Cowboys will open the season on Tuesday by hosting Grandfield. Tipoff for the high school games will be 6:30 p.m. after a pair of junior high contests against the Bearcats. It will be the homecoming game for Ryan because of the uncertainty of the future availability of the facilities. Construction of the remodeled gym that opened in 1957 is going well and at the moment is on time for completion near the end of the current basketball season. The updated facility will feature new home locker rooms, a new concession area, and new entry. The biggest change in the gym will be an added limited number of seats on the south side. The south side will be the new home of the bench areas and the scorer’s table. Watch for announcements about changes for the location of upcoming games on social media or in this newspaper. Second-year Cowgirl coach Steve Spangler is hopeful his three returning starters, who were all-conference a year ago, will be able to carry the squad that is small in number. The Cowgirls will depend on the return of Samantha Good, Lily York and Juliet Spangler to carry what will be a rather young squad that will feature five juniors, one sophomore and three freshmen. Those three will be counted on to provide the bulk of the offense and hopefully, the Cowgirls can find some more scoring. York was the co-offensive most valuable player in the Southern Eight Conference a year ago and was the leading scorer in 13 of the Cowgirls’ 24 games. Spangler says at least one and at times, two freshmen will work their way into the starting lineup. The Cowgirls traveled to Oklahoma City to face some tough foes in preseason scrimmages and the team held its own, according to Spangler. Last season the Cowgirls made a marked improvement but still finished only 8-16 after going 3-20 in 2017. The team did finish as the district runner-up. In the Southern Eight, Spangler believes that Big Pasture will be the top contender as the Lady Rangers welcome all five starters back from a year ago. The Cowboys will be under the direction of first-year coach Austin Masoner. Not only is it his first as the Cowboy mentor, but it is also his first year of full-time coaching responsibilities. According to Masoner, the Cowboy practices have been spirited and the 15-man roster seems to be buying into what Masoner hopes the team will become during the 2019 campaign. Overall, the Cowboys will feature some size that will enable play with an inside post. Guard play is also in good hands for the Cowboys. Grayson Tomberlin, who started a year ago as a freshman, and senior Skyler Parkhill, a Southern Eight Conference all-star last season, will be called upon to carry the offense. Those two were the leading scorers for the Cowboys in 11 of the 22 contests last season. Travis Fristoe and Brock Smith will be counted on to help carry the Cowboy defense. The Cowboys will employ a great deal of zone defense, but Masoner noted he would also mix in some man-to-man and specialty defenses of the situation called for it. The Cowboys’ weakness this season will be the overall lack of experience. The Cowboys also lack depth at the guard positions, but Masoner is hoping he can develop some of the other plays to help with the ball-handling. The Cowboys hope to rebound from the disastrous 2018 season when the Cowboys slumped to a 5-17 mark after posting four straight winning records and two district titles. The race for the conference title may be a tough one with Waurika and Big Pasture looking to be the top contenders along with conference newcomer Frederick. 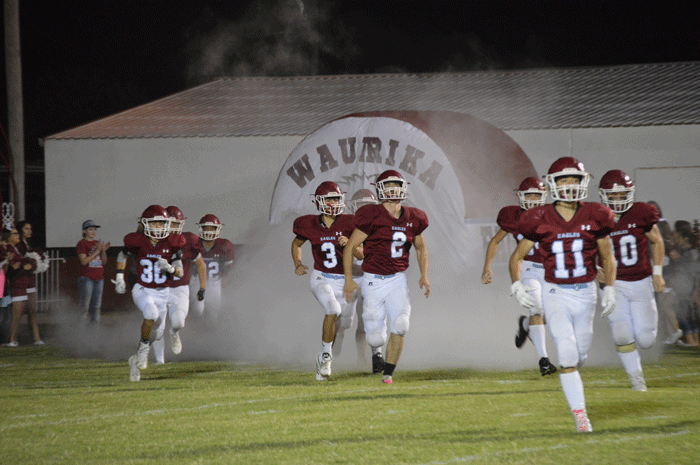 The scheduled season-opener with Waurika was postponed because of the involvement of both schools in the football playoffs. Following the season lid-lifter with Grandfield, the Cowboys and Cowgirls will travel to St. Jo, Texas for an invitational tournament. The Cowgirls get the tourney started a week from today (November 29) with a 1:30 p.m. contest against Alvord. If the Cowgirls get a first-round win, they will play on November 30 at 1:30 p.m. against the winner of Sacred Heart and Ringling. The Cowboys will take the court in the St. Jo Tournament on November 29 when they take on the Paradise Junior Varsity. Tipoff is set for 3 p.m. and the game will be played in the auxiliary gym at the St. Jo campus. A win would advance the Cowboys to a 6 p.m. game on November 30 against the winner of Sacred Heart and St. Jo. The next weekend the Cowboys and Cowgirls will compete in the Black and Gold Classic hosted by Wilson. The community banded together Wednesday evening around 8:15 to cheer on the Waurika Eagles as they begin the playoff season this Friday evening at home against Cyril. Everyone is encouraged to attend the pep rally tomorrow (Friday) at 2:00 pm at Waurika High School. Below are the photos from last night’s pep rally/bond fire. A review of the 2018 Ryan High School football season reveals a number of outstanding performances by individuals and by the team. More importantly, the 2018 season will go down as a season where the Cowboys overachieved preseason expectations. The Cowboys finished with a 7-4 mark and earned a runner-up finish in District B-4. Ryan was tabbed by most preseason polls to finish fifth in the district. 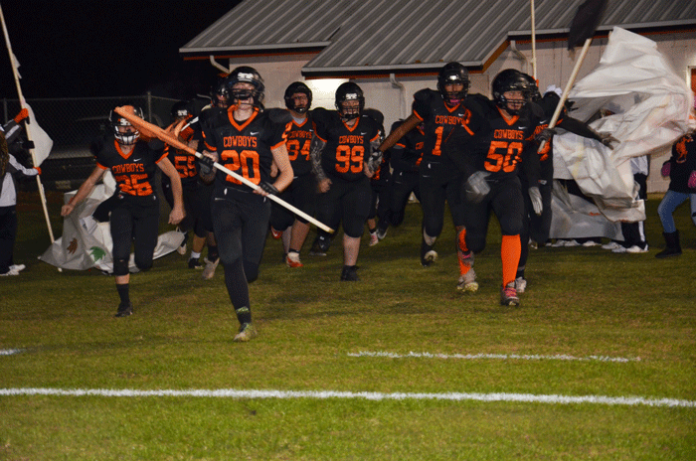 The season ended with a 58-12 loss to Burns Flat-Dill City in the first round of the Class B playoffs. 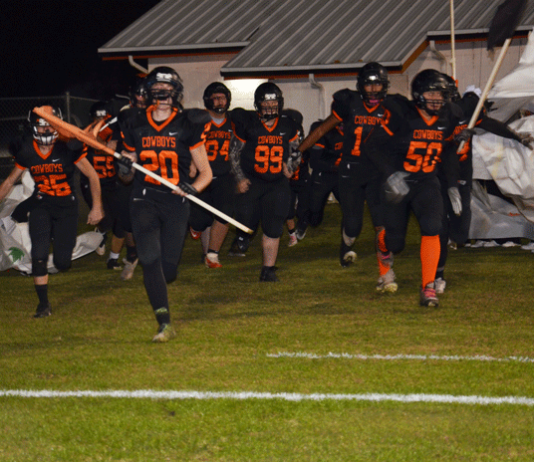 BFDC advanced to the quarterfinals last week with a 34-26 victory over Pioneer-Pleasant Vale. Offensively the Cowboys entered the season with talent at the skilled positions with three returning starters. However, it was the offensive line that was the biggest question. After the first game, the Cowboy offensive line started to jell and it helped the Cowboy offense to produce the third highest average number of points scored in a season in school history. The three key offensive linemen were Sam Brown, Justin Williams and Trey Bryant. Andrew Villerreal and Kalen Weldon were key blockers from the receiver positions. 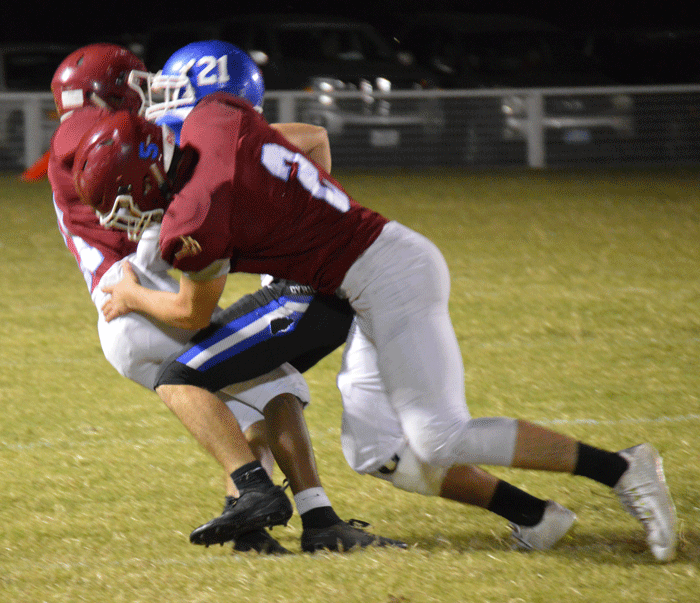 The defense turned in a couple of impressive performances – a shutout victory over hapless Temple in the third game of the season and a key 24-6 district victory over Wilson in the eighth game of the year. But, for the most part, the defense never was able to stop opponents from gaining lots of yards and scoring points. The Cowboys gave up 50 or more points to three opponents. The amazing thing is they had a 1-2 record in those games. The Cowboys gave up an average of 350 yards per game to the 11 opponents. Fortunately, the Cowboys were able to average 367 yards of offense per game to help lead them to the winning mark. The seven wins for the Cowboys has not happened often. Only eight times in 99 seasons have the Cowboys won seven games. The Cowboys have won seven or more games only 26 times during the 99-year history of football which is just over 25% of the time. The offense was definitely the key to the success of the 2018 season. Ryan came up just short of having two 1,000-yard rushers. Grayson Tomberlin was the top ball carrier for the Cowboys with 1,172 yards on 162 carries. Tomberlin had a season-high 273 yards against Bray-Doyle, which was the 12th best mark in school history. Tomberlin compiled the fourth and seventh best yards passing totals in school history against Bray-Doyle and Maysville, respectively. His four touchdown passes against Bray-Doyle is tied for the fifth most in school history. The sophomore quarterback finished with 1,688 yards passing and 11 touchdowns. Skyler Parkhill was just behind Tomberlin’s rushing total with 913 yards on only 107 carries for an average of 8.5 yards per carry. His 228 yards rushing against Empire is tied for the 26th best individual rushing total in school history. His six rushing touchdowns against Empire was the second most in school history. Parkhill was the leading receiver for the Cowboys with 39 catches for 932 yards – coming up just short of a 1,000-yard double-double in yards rushing and receiving. In the game against Wilson, Parkhill snagged nine receptions, which is the second most in school history. Parkhill owns that school record with 11 catches in a game during his freshman season. The four-year starter for the Cowboys also had two other games with seven receptions, which tied him for the fifth most in school history. Parkhill also broke the school record for most yards receiving in a game. He totaled 215 yards receiving against Bray-Doyle to set the record. He also had 189 yards receiving against Maysville and Caddo and that is the second most yards receiving on the school record books. His 154 yards receiving against Wilson is the eighth best mark in school history. In the game against Bray-Doyle, Parkhill had four receptions for scores and that is the top mark in school history. As you might expect the two Cowboy performers led the team in scoring in 2018. Parkhill total 176 points for the season with 48 coming against Bray-Doyle – the most in school history. Parkhill had 15 rushing touchdowns and 10 touchdown receptions. He also had an interception return for a touchdown. 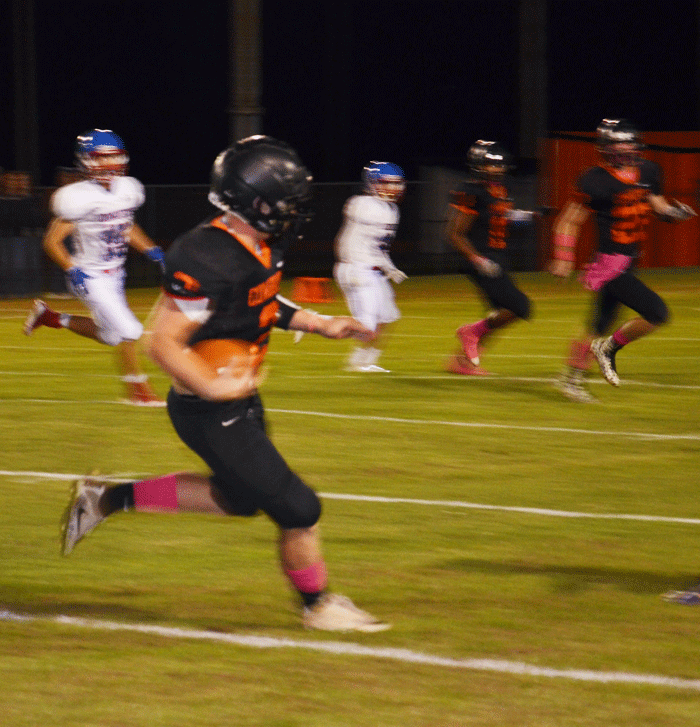 Parkhill also had nine two-point conversion runs and one two-point conversion reception. Parkhill’s interception return was the longest in school history – 99 yards against Empire. Travis Fristoe contributed to the Cowboy rushing game. He became eligible after the season started, but had 277 yards rushing and scored five touchdowns on the ground. He also had a touchdown reception. 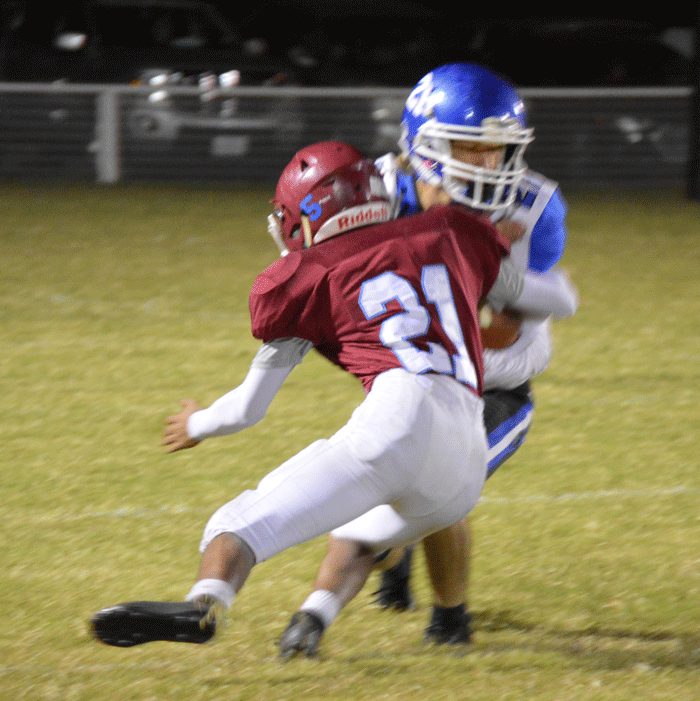 Weldon was another top target of Tomberlin in the passing game. The Cowboy senior finished with 18 receptions for 319 yards and three touchdown receptions. He also returned a fumble for a score and had five two-point conversion receptions. As a team, the Cowboy offense did not produce any school records but did record some impressive marks in several categories. The 276 yards passing against Bray-Doyle was the fourth highest total in school history and the 642 yards against the Donkeys represents the fourth highest total in school history. Ryan had 12 receptions in games against Maysville, Wilson and Central High which ties for the ninth most in school history. The 24 first downs earned against Bray-Doyle were the third most in school history. And, the 152 points scored by Bray-Doyle and Ryan combined set a new school mark. The 98 points scored by Ryan and Grandfield tied for the seventh most in school history. On the defensive side of the ball, the Cowboys gave up the fourth most points in a game in school history as Bray-Doyle hit the Cowboys for 74 points. The 507 yards gained by Bray-Doyle in the game was the sixth highest total by an opponent in school history. Caddo rolled up 502 yards on the Cowboys and that mark is the seventh-highest total in school history. The Cowboys had six seniors that completed their gridiron careers – Williams, Parkhill, Weldon, Brown, Pacen Wiest and Fristoe. Best All-Around Performance: A 24-6 victory over Wilson in what were awful playing conditions. Most Dramatic Win: The memorable 78-74 victory over Bray-Doyle tops the list of exciting games this season. The Donkeys scored 30 points in the fourth quarter to rally from a large deficit before the Cowboys scored with only four seasons left on the clock to pull out the win. Most Memorable Performance: The Cowboys were very impressive in the 84-36 victory over Empire. The Cowboy defense contributed scores on interception returns and also had a kickoff return in Ryan’s mercy-rule win over the preseason pick to win the district title. Most Forgettable Game: The 57-26 loss to Caddo was by far the Cowboys’ poorest performance of the season for a game that lasted four quarters. The Bruins finished the season with a 2-8 record. 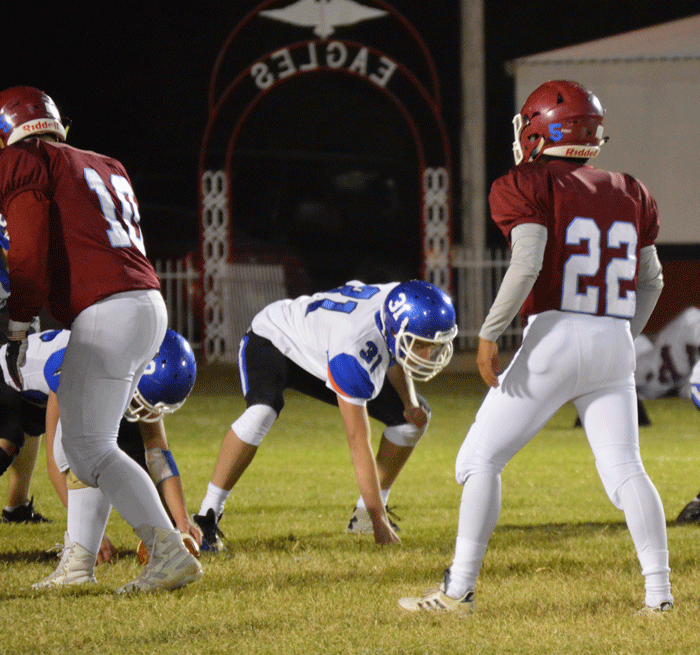 Most Embarrassing Loss: The 58-0 loss to rival Waurika was a tough one although the Eagles are putting together one of the finest seasons in school history. But, The Cowboys had six turnovers in only one half of football and never gave themselves a chance to be competitive against the eventual district champion. Honorable mention is the 68-8 loss in the season opener to Snyder when the Cowboys looked totally disorganized and caused a great deal of pessimism among Cowboy fans about the 2018 season. Most Improvement: After the difficult loss to Snyder, the Cowboys came back in the second week of the season with an impressive 70-28 victory over Grandfield. Most Undisciplined Game: The Cowboys gained the 78-74 win over Bray-Doyle despite 24 penalties for 218 yards. The Cowboys had several personal foul penalties and three unsportsmanlike conduct penalties. Penalties plagued the Cowboys through much of the season. Key Win: Every district game was important for the Cowboys because the talent edge was not that great, but the 24-6 win over Wilson helped propel the Cowboys into the runner-up position in the district that enabled them to host a playoff game for the second year in a row. Biggest Blunder: This was not committed by the Cowboys, but rather this reporter. Throughout the season the name of Skyler Parkhill was misspelled. Apologies are in order to the outstanding Cowboy senior.